Well, well, well! Talk about a twist! 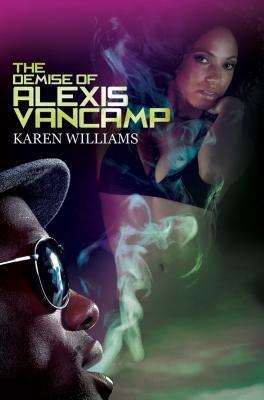 In the steamy The Demise of Alexis Vancamp by Karen Williams, readers watch just that, the demise of Alexis and her family. The quick rundown: Alexis hails from a loving, wealthy family. She’s college educated and works for her father’s company making a good living. While working, she interviews the man who becomes her addiction, Santana. Santana is the total opposite of the man Alexis is engaged to; he’s mysterious and thuggish. This relationship takes Alexis on a wild ride, and ultimately, leads to her downfall. While reading this book, I was appalled at the stupidity of Alexis and the lengths she went through to keep Santana. Since this book is short, I won’t reveal too much about the story or the really big question I want to ask. Ok, I lied. I really want to know why?! Why do this when she had no part in it? *Huge sigh* This book is another example of a person being out of her element and being so blinded by what she deems as love that she cannot see the truth. It’s also a tale of how our pasts can come back and haunt us. In short, this book was very hot (you might have to fan yourself to cool off) and entertaining, despite my disgust with Alexis’s behavior. I was shocked at the naivete of Alexis, but I could see where this book could be a lesson for those involved in romantic relationships such as this. I really wasn’t expecting what happened in the end, as I’ve only seen that stuff on Maury!